Vibration measurements are widely accepted as the most effective technology for diagnosing the condition of rotating machinery. The simple fact that every machine malfunction generates its own unique vibration pattern makes vibration analysis the most applied diagnostic technology. 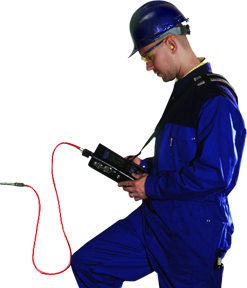 Correctly performed vibration analyses provide information about the condition of new, existing or overhauled machinery and rotating constructions. However, after acquiring reliable vibration data the real specialism is needed: the interpretation of the measurement. Different kinds of measurements are hard to compare. Besides the many applications of vibration measurements, there are also many different perceptions on the implementation of the measurements. Measurements based on overall values combined with a red, yellow and green indication only provide a general overview on the total vibration level. Comparing these measurements with previous measurements will result in a trend that may show an in- or decrease of the values. What is causing this in- or decrease in vibration remains unknown. Visual inspections (meaning valuable downtime) are still needed to determine which part is worn and should be replaced. 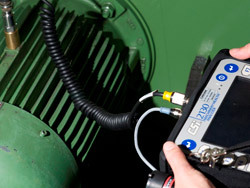 Van Geffen VMS only performs vibration measurements based on spectrum analysis. With this kind of vibration analysis the vibrations are analyzed in graphical plots or so called spectrums. With these spectrums it is determined which frequencies hence which malfunction is causing the in- or decrease in the vibration levels. A correct interpretation of these spectrum analysis in which parameters as rotational speed, load, temperature etc. are considered require extensive knowledge and many experience. This diagnostic technology is however the only suitable for a reliable predictive maintenance program for rotating equipment.